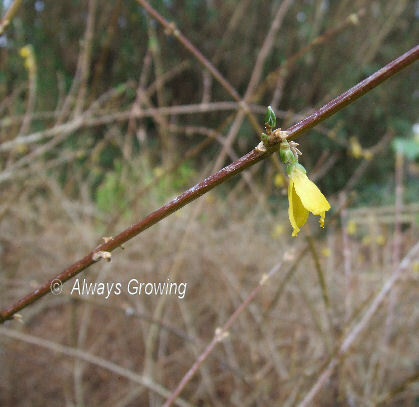 Sunny and cool days means that it is warm enough for the forsythia to start blooming. The first few flowers have just started showing. It seems funny to see the forsythia, a harbinger of spring, blooming now when so many other plants that usually bloom later than forsythia are starting to show color. 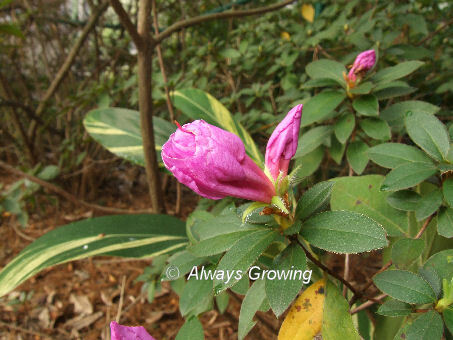 A few of the purple azaleas are already showing a few flowers. All of this before any of the daffodils bloom. I have a feeling that with the milder than normal winter we have had, everything is going to burst into flower all at once instead of there being a progression of blooms. 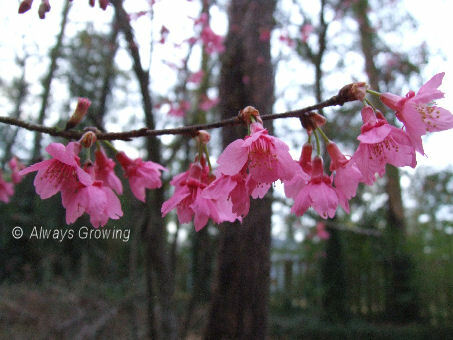 Spring just may come early and be bloomed out in just a week or two. 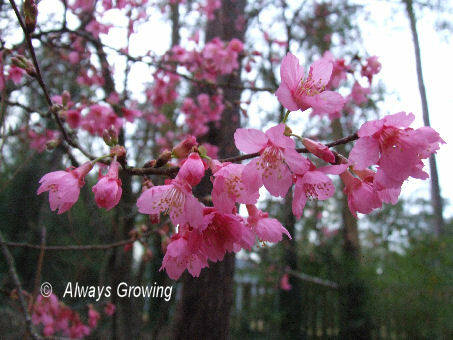 For the last three years, I have posted about a sure sign of spring arriving here at my home near the Gulf Coast. That sign has been my neighbor’s redbud tree. Whenever it bursts into bloom, cold weather is over. We may still get some chilly weather, but no more freezes or near freezes. Last weekend while working in my back garden, I thought I saw a little purple-pink over in her yard, but I thought, no, it’s too early. A quick walk over confirmed the first show of color. 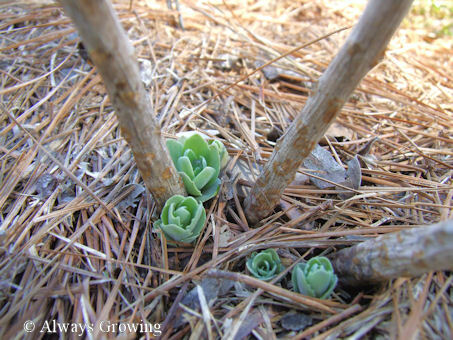 All this past week, we have been having mild weather and plants are waking up. I noticed last week in New Orleans where it is a tad warmer than we are, the Japanese Magnolias are in full bloom. Well, yesterday, the redbud was in full bloom. Just gorgeous. Since it was a little overcast this weekend, it was nice to have these pretty flowers to brighten the landscape. The mild weather was a blessing this weekend. After working all week inside, I just can’t wait to get outside in the garden. Several chores got done – planting some daylilies, cutting back the bamboo, etc. Checking out the garden showed that a few gladiolas are already sprouting, and other signs of life were all around. After weeks of cold weather, it looks like we will be welcoming an early spring. A full time job, two sets of out-of-town guests, and great gardening weather equals no time for blogging. I can’t believe it has been so long since I last posted. The warm, spring weather has really sent the garden into warp speed. Everything seems to be blooming all at once. This is so different from last year. The Kwansan Cherry tree bloomed better than ever this spring. The azaleas were gorgeous this year, but now they are just about finished. Here are some photos of them at their peak. 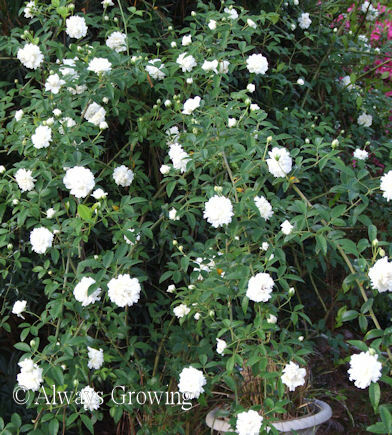 The white Lady Banks rose also had its best year. It is finally big enough to make a nice showing. Also, this was the first year since I planted it that I could smell its fragrance. I guess before this year there were simply not enough flowers to have an aroma waft around. 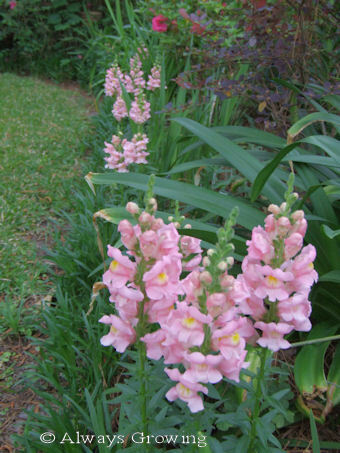 The pink snapdragons that I planted last fall are also enjoying the warm weather and rewarding me with big, bunches of blooms. This color has worked out nicely with the azaleas blooming nearby and the Blushing Knockout roses behind them. Flowers aren’t the only thing showing a great deal of growth. All of the hostas are up and seemed to show up overnight. 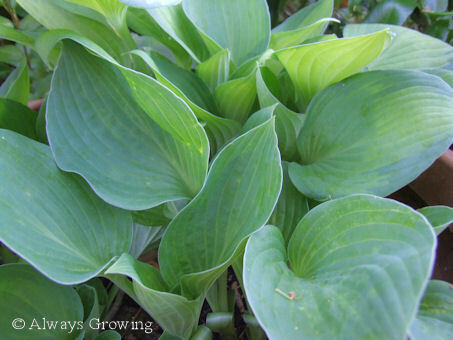 This Blue Cadet hosta is a perfect example of tiny growth to big plant in hardly any time at all. 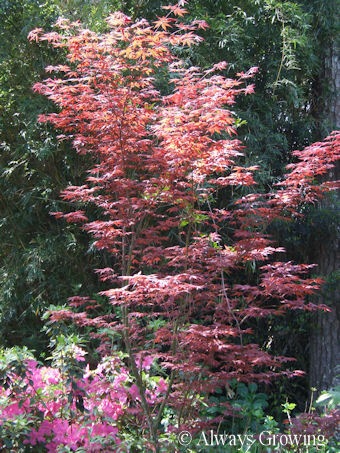 The Japanese maple also seemed to leaf out overnight. We had a rather cold winter here for the Gulf South, but in the middle of February, winter went away for good, and it has been wonderful for the garden. Easter may be late this year, but an early spring was definitely welcomed. Spring flowers continue to show up. In fact, the last few days, I have been surprised more than once by new flowers. 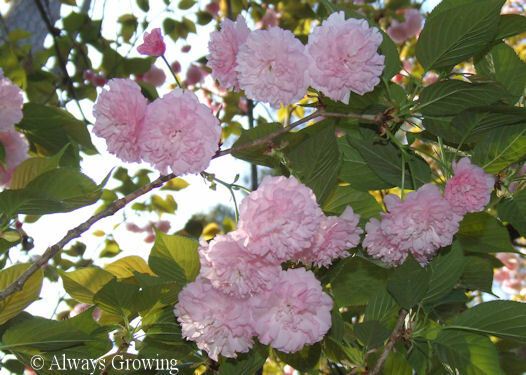 I’ll be watering the garden, look up, and am shocked to find a tree or shrub in bloom. I am beginning to think I am not the most observant person. 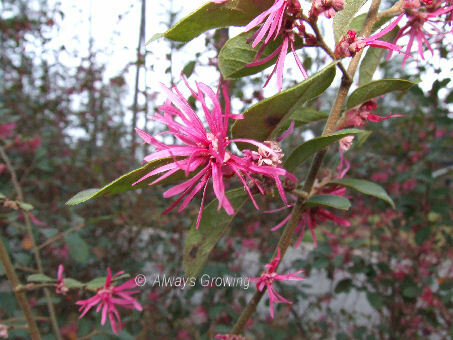 One of these “surprise” flowering shrubs is a native azalea (Rhododendron austrinum). Earlier this spring, I thought I only saw one flower bud on the bush and was so disappointed. I even considered digging it up and moving it somewhere less noticeable since it is taking up valuable space in a sunny area of the garden, and goodness knows, there are very few sunny spots in my garden. Since this is about the fourth year I have had this, I thought one flower cluster just wasn’t enough. Well, I don’t know if it read my mind or what, but all of a sudden this native azalea burst into bloom. 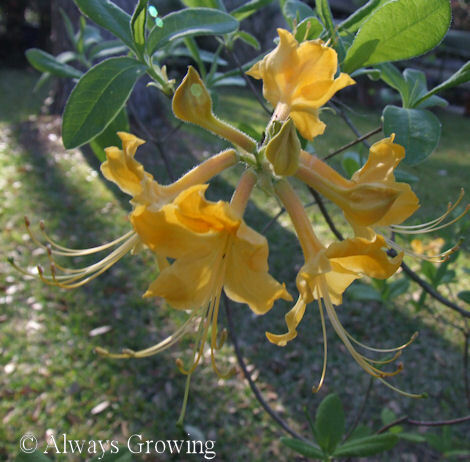 This native azalea is deciduous, and the brilliant golden blossoms have a lovely honeysuckle fragrance. 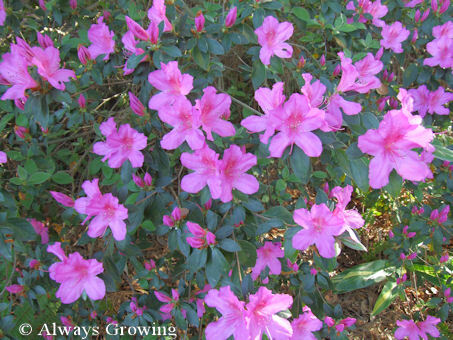 As with all azaleas, this particular one likes acid soil, part sun, and moist but well-drained soil. 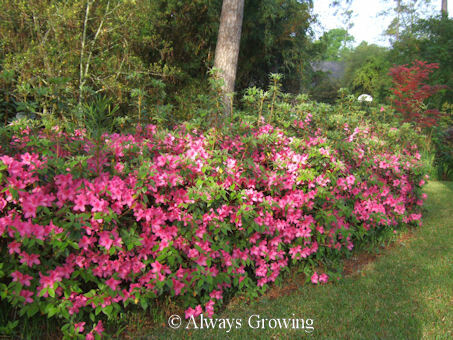 Hardy to zone 6 and about six feet tall and two feet wide, this azalea makes a wonderful addition to a woodland garden. This is still a small bush, but it is growing steadily every year. I am hoping in a few years, it will be large enough to really stand out in the garden. 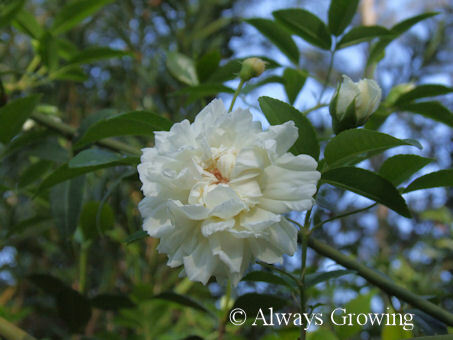 I am so happy I was wrong, and that there was more than one bloom on this shrub this season. Even though the weather has been warm and pleasant for the last month, we still look forward to the official start of spring, and the first full day of spring did not disappoint. Bright sunshine, a high of 80 degrees, and a light breeze made for a perfect day. Just about everything in the garden has already returned from winter dormancy. There are only a few plants that haven’t awakened yet. The daffodils have now finished blooming, and the azaleas have started. 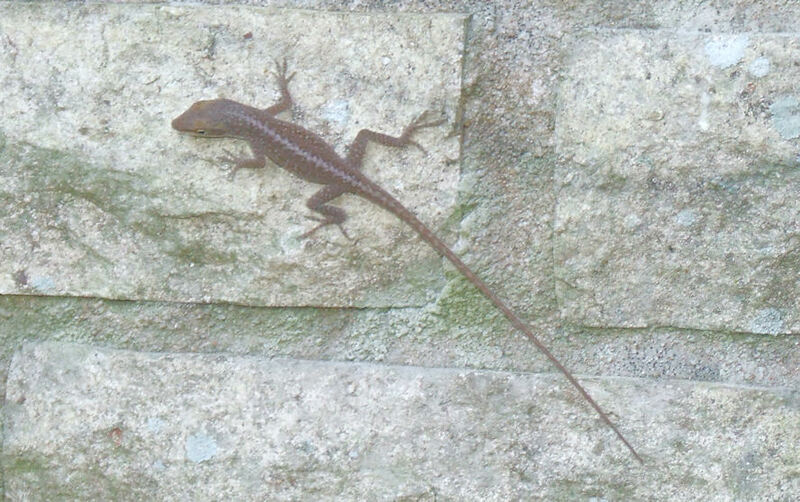 This weekend, I saw the first frog of the season, dear hubby saw our little black snake from last year today, and the first anole was sunning itself this afternoon. Late this afternoon as I was walking around the garden, I saw the first hummingbird of the season. The first hummingbird on the first day of spring. Can’t ask for more. Gardening experts are always encouraging us to place together plants with similar needs when it comes to water, light, etc. One pairing in my garden that wasn’t planned but worked out well, is based on time of bloom. 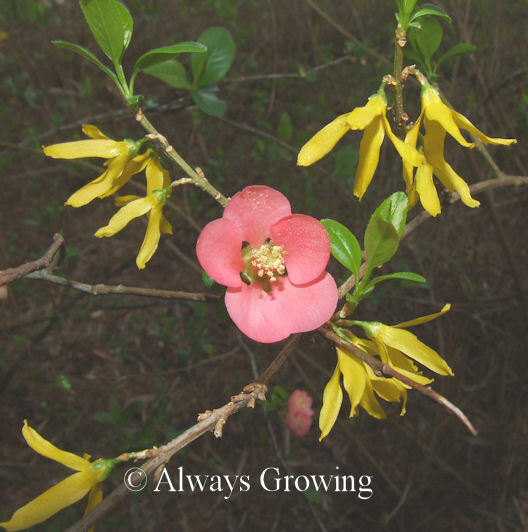 In late winter/early spring the forsythia and quince start blooming. The forsythia started a little over a week ago and the quince quickly followed. Both of these shrubs were put in the first spring we were in our home. Dear hubby bought them at a local hardware type store. 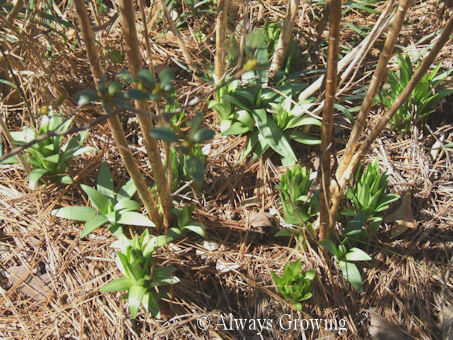 They were quickly planted by two very inexperienced, young homeowners and have pretty much survived on their own. Except for a little watering in the summer, these bushes are pretty much left alone, but every year, as soon as the weather warms up a bit, the flowers pop out. While I would never have thought to put these two colors together, I certainly do feel the yellow and and the light coral pink look great as a pairing of early spring bloomers. Winter storm alerts stretch 1800 miles across upper United States. The pictures on the evening news showing cold, stormy weather from Montana to New England were just unbelievable. I feel so bad complaining about how sick I was of our cold weather, and now so many people are still dealing with winter storms. Here on the Gulf Coast of Louisiana, we hit 80 degrees today, which tied an all time high set in 1980. Now everything seems to be coming up out of the ground. Everyday there is something new to see. So, for those of you still in the cold, here is a photo just for you as a reminder that the first signs of spring really aren’t that far away. 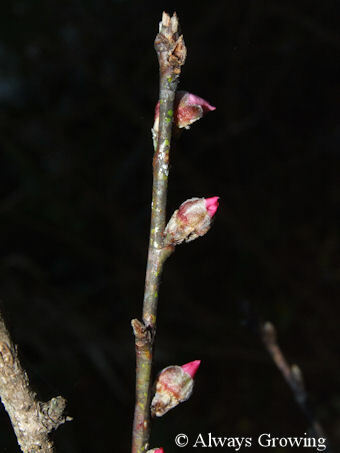 Our peach tree’s buds have swollen and are starting to show color. 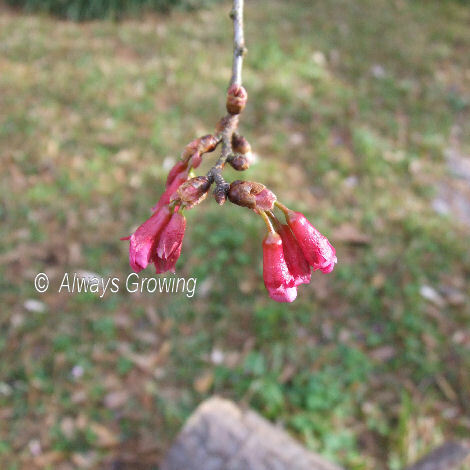 As I walked around the garden today, I saw so many buds starting to swell and show color either for leaves or flower buds. 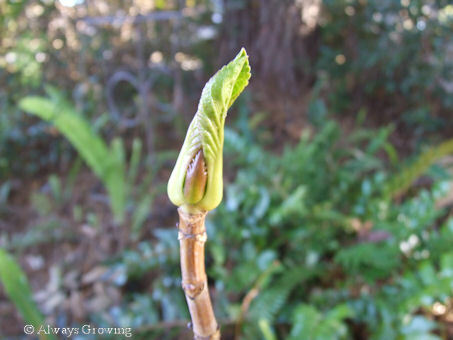 The fig trees are showing green indicating new leaves will be unfurling soon, and the Bartlett pear trees’ buds should be showing color any day now. In New Orleans, the Japanese magnolias are already in full bloom. We are about 30 miles north of there, so ours are not quite ready to bloom, but it shouldn’t be too long before the flowers show up. When we were having all that cold weather in January and early February, I was afraid spring would be late this year, but it seems that, all of a sudden, spring has even come a little early. After a week of temperatures in the high 60’s to low 70’s, it certainly feels like spring has arrived. But, now I know that winter is over. For the last few weeks, I have seen so many plants that died back in the winter showing signs of life. I have been seeing trees leafing out, and while I was driving to work today, I even saw one tree that had white flowers all over it. They had to have popped out overnight. While walking around the garden early this evening, I was surprised to see this. The hydrangeas have broken dormancy. 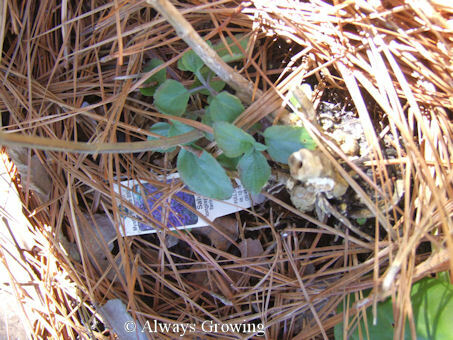 Yes, that is a branch of a white lace cap hydrangea showing the leaves beginning to open. I checked the other hydrangeas, and they all are showing signs spring is here. Even though the daffodils are not blooming yet, I think Old Man Winter has definitely retreated from the Gulf Coast. This has been a cold winter even way down here in the South, and I am glad to tell it good bye. This weekend will be perfect to start planting. It’s about time I was able to get out in the garden. While autumn is my favorite season, it is spring that I anticipate and look forward to so much. Little signs, as I have been writing about for the last few posts, are showing that spring is slowly loosening the grip Old Man Winter has had on the Gulf South. While temperatures are still dipping into the very chilly area, more and more plants are finding conditions are warming up. Most of the daylilies I grow are evergreen (recommended for the Gulf South), but I have started trying out more deciduous ones, and so far, they are doing well. “Chicago Apache” along with a few others are showing green growth already. Mystic Spires is another plant that is starting to come back. Autumn Joy, which I planted for the first time last spring, is also showing little green rosettes. I am so glad this plant has returned. I was a little unsure how well this plant would do in my garden because of our high heat, but it seems to like it here since it is coming back. The lilies starting showing up about three weeks ago. Both the Easter lilies and the “Triumphator” lilies are up and the cold weather we have had has not bothered them at all. I am beginning to think that lilies are a lot tougher than I thought they were. 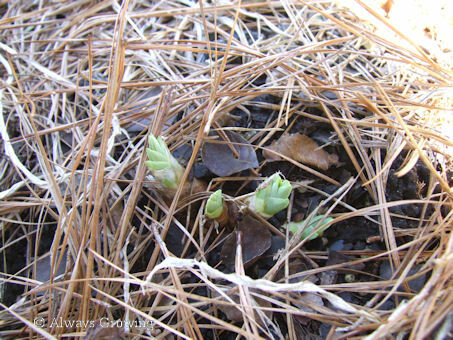 While our last frost date is around March 1, after about February 15th, we do not get the real hard freezes that can cause so much damage to newly emerging plants that have already started to wake up with the warmer temperatures we see about this time of year. So, this means I should be seeing more and more little signs of spring returning.